Wouldn't it be great to be free of the monthly burdens of gas and electricity charges? Wouldn't it feel great to know that you were reducing your carbon footprint and helping reduce consumption of our precious resources and reduce energy waste? Well I happen to think that it would be freakin' great! And I think the solution is to rebuild our house with a Passive House design in mind. You see, our house already faces north, so if we were to put massive Passive House windows along the back South facing wall, then we could best utilize the power of the sun to heat our home in the winter without the use of a bulky, enviro-crushing furnace! By designing and building with the guidelines of the Passive House concept, the house would become super energy efficient and worth the extra cost (about 10% more overall cost than if you were to build with a furnace in mind) to me. Currently there are only two homes in Toronto that use this concept, but smart Europeans have been using this concept for about 20 years now. I want to join their ranks. 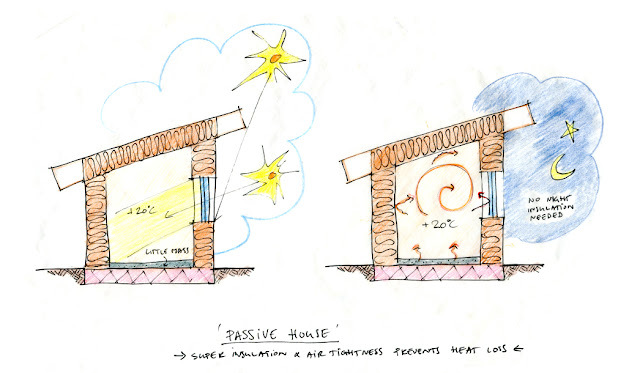 This architect explains the Passive House concept really well. Check him out. The picture above was swiped from his site and I give full credit to him at ecocentricdesign[dot]ca.